Alan Green, the developer who built FalmouthPort, Treetops and the Boatyard Condominiums, gave these 10.5 acres to the town in 1982. 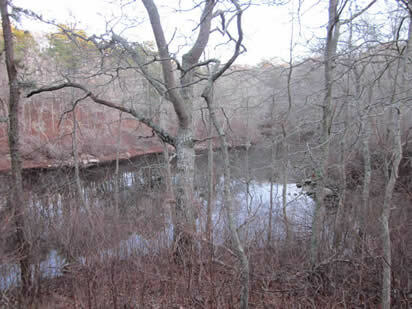 Although the intent of the gift was later questioned by town officials, the town finally agreed that the wooded parcel should remain conservation land and not be used for some other municipal purpose. The Green property is bounded by Evangeline and Ransom Roads, off Sippewissett Road. The parcel is steeply sloped alongside a small pond; in an earlier time a farm for exotic ducks was on the property. There is limited parking on the edge of Ransom Road, which can be reached by Woods Hole Road or Sippewissett Road.